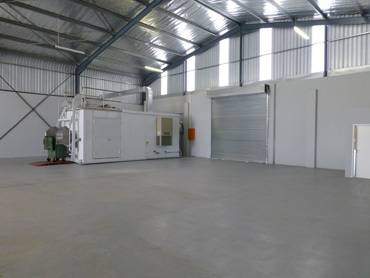 Micro-Waste® installed its latest Micro-Waste® Disinfection System™ (MDS®) at a commercial regulated medical waste treatment facility in the Republic of South Africa. The new Model MDS-2481, which uses microwave-assisted moist heat disinfection as in its other model, is the first microwave treatment system technology in installed on the African continent. The MDS® was designed and manufactured in the United States by Micro-Waste Corporation®. The MDS-2481 was independently tested by one of the most respected laboratories in South Africa to ensure that the MDS® treatment system met the license requirements for the facility as well as the regulations issued by the Republic of South Africa. Facility personnel and laboratory personnel performed onsite biological disinfection efficacy testing using a standard disinfection test protocol of commercial Bacillus atrophaeus spores [or Bacillus subtilis (Niger)] as generally recommended by the State and Territorial Association on Alternative Treatment Technologies (STAATT) and as accepted by the Department of Environmental Affairs of the Republic of South Africa. The system provides the capability for treatment of regulated medical waste, termed health care risk waste in South Africa, in accordance with South African regulations for healthcare provided throughout South Africa. 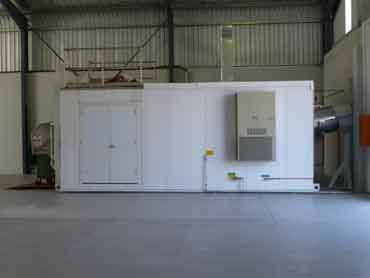 The system is expected to provide at installation a total operating cost (including labor, utilities, repair, maintenance, and waste disposal) of approximately 8 to 10 cents per pound (R1.4 to R1.75 per kg), much less than the typical commercial medical waste transport and treatment costs of 15 to 30 cents per pound (R2.6 to R5.3 per kg). At the grand opening of the facility, the South African Member of the Executive Council (MEC) for Economic Development and Tourism touted highly the installation of the MDS-2481 at the facility as a significant contributor by "blazing a new path in our quest to create an economy that is not only growing but which is built around the pillars of sustainability...through which sustainable jobs can be created for local people..."
1. The Micro-Waste® Disinfection System™ was prepared for shipment at Micro-Waste's® fabrication facility in Fort Worth, Texas. 2. The Micro-Waste® Disinfection System™ was loaded by the factory overhead crane onto the low-boy trailer for shipment to the local port for crating and ocean shipping. 3. The spare electrical parts, including spare microwave generators, were hermetically sealed in barrier packaging with moisture inhibiting desiccant packs to prevent corrosion during shipment. The microwave treatment section discharge assembly, spare shredder assembly and spare parts were shipped in an ocean shipping container. 4. The MDS-2481 was crated and sealed for ocean shipment to prevent corrosion in transit, then uncrated at the receiving shipping facility at the local inbound shipping port. The System was then delivered to the facility from the port by tractor-trailer. 5. The system, weighing approximately 33,000 pounds (15,000 kg), was off-loaded from the trailer at the final facility destination by two small truck cranes. 6. 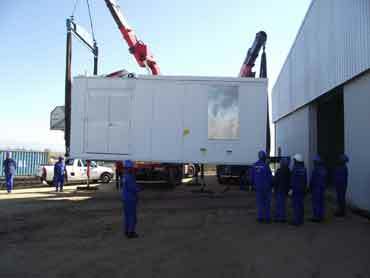 The MDS-2481 was rolled into the facility building using a small forklift. 7. The microwave treatment section discharge assembly was lifted by a small truck crane and installed onto the MDS-2481. 8. In coordination with the facility's architects and engineers, Micro-Waste's® engineers ensured that the MDS-2481 configuration would allow excellent interface with the facility design and operations. The MDS-2481was positioned using a forklift so that the microwave treatment section discharge protruded through the facility wall to allow discharge to the waste compactor outside the building. This configuration permits the facility employees to work in a conditioned area and allows the waste compactor to be picked up by the local waste management company without interference with operations. 9.The facility operators required that the MDS-2481 use the waste carts they specified. Since Micro-Waste® maintains its own engineering and manufacturing capabilities, the cart lift system can be designed and fabricated for any cart system required by the customer. The cart filled with waste can be rolled onto the platform scale of the weighing system. 10. The weighing system was calibrated in kg by a certified scale company for operational monitoring and regulatory reporting. The scale can be calibrated in either metric or imperial units. 11. The MDS-2481 received thorough preoperational testing by Micro-Waste® personnel onsite to verify that the System arrived on site without physical damage and ready for operation and performance testing. The system was operated by facility personnel as part of the onsite training. 12. As part of the Micro-Waste® training, facility operations personnel, supervisors, and and management operated the system during component functional testing and biological efficacy performance testing. 13. Facility certified microbiological personnel performed biological testing by inserting standard commercial biological test samples below the shredder. 14. Third-party laboratory personnel were responsible for and oversaw the biological performance testing to ensure that the MDS-2481 met facility license and regulatory requirements. 15. Third-party South African laboratory management was onsite throughout the biological performance testing to oversee operations and and ensure that all testing protocol was followed and test samples properly handled. 16. The performance test biological samples were under the complete control of the highly recognized third-party South African laboratory. The test samples, with control test samples to ensure proper quality control and incubator operation, were managed and incubated by the laboratory at their facility. Following completion of the testing, the laboratory issued a certified report to the facility operators which was accepted by the South African regulators in support of the operating license of the facility for the commercial treatment of health care risk waste. 17. The facility operator installed a temporary, open top treated waste container to allow for startup testing of the MDS. All waste treated and discharged from the MDS-2481 is rendered generally unrecognizable as healthcare waste and is reduced in volume by approximately 80% and readily accepted by landfill operators. 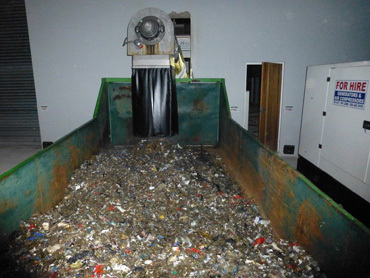 The treated waste has is slightly damp and has no free liquids. 18. Following biological performance testing, the facility was ready for the grand opening and commercial operation in less than one week after installation of the MDS-2481. 19. The facility using the MDS-2481 established the state-of-the-art treatment and sustainability standards against which all other health care risk treatment facilities will be measured in the Republic of South Africa and the continent of Africa (see MDS Sustainability). 20. The grand opening of the treatment facility included the demonstration of the MDS-2481 by the two majority owners of the facility, Mr. Mdu Ngcobo and Mr. Sifiso Kuzwayo, to the South African Member of the Executive Council (MEC) for Economic Development and Tourism, Mr. Michael Mabuyakhulua (L - R). 21. The facility was opened by the South African Member of the Executive Council (MEC) for Economic Development and Tourism. 22. At the grand opening of the facility, the MEC for Economic Development and Tourism, Mr. Michael Mabuyakhulua, touted highly the installation of the MDS-2481 at the facility as a significant contributor to the Republic of South Africa by "blazing a new path in our quest to create an economy that is not only growing but which is built around the pillars of sustainability...through which sustainable jobs can be created for local people...". 23. Following acceptance of the performance test results and final issuance of the facility operating license, the facility immediately began receiving waste to support the health care risk waste community. 24. Using the MDS-2481, the facility successfully processes thousands of kilograms of health care risk waste daily in the most sustainable manner available. ©Copyright 2007-2017 Micro-Waste Corporation®. All Rights Reserved. Micro-Waste®, Micro-Waste® Disinfection System™ and MDS® are trademarks of Micro-Waste Corporation®.